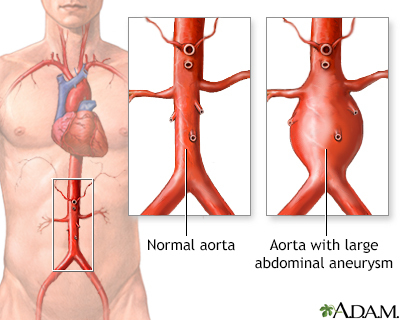 You had endovascular aortic surgery repair for an aneurysm (a widened part) of the large artery that carries blood to your lower body (aorta). Your doctor made a small incision (cut) near your groin to find your femoral artery. A large tube was inserted into the artery so that other instruments could be inserted. An incision may have been made in the other groin as well as the arm. Your doctor inserted a stent and a man-made (synthetic) graft through the incision into the artery. X-rays were used to guide the stent and graft into your aorta where the aneurysm was located. The graft and stent were opened up and attached to the walls of the aorta. The cut in your groin may be sore for several days. You should be able to walk farther now without needing to rest. But you should take it easy at first. It may take 6 to 8 weeks to fully recover. You may feel discomfort in your abdomen for a few days. You may also have a loss of appetite. This will get better over the next week. You may have constipation or diarrhea for a short time. Walking short distances on a flat surface is OK. Try to walk a little, 3 or 4 times a day. Slowly increase how far you walk each time. Limit going up and down stairs to about 2 times a day for the first 2 to 3 days after the procedure. DO NOT lift anything heavier than 10 pounds (4.5 kg) for 2 weeks after the procedure. If your incision bleeds or swells, lie down and put pressure on it for 30 minutes, and call your provider. When you are resting, try keeping your legs raised above the level of your heart. Place pillows or blankets under your legs to raise them. Ask your provider about follow-up x-rays you will need to have to check if your new graft is OK. Having regular checkups to make sure your graft is working well is a very important part of your care. Your provider may ask you to take aspirin or another medicine called clopidogrel (Plavix) when you go home. These medicines are antiplatelet agents. They prevent the platelets in your blood from clumping together and forming clots in your arteries or stent. DO NOT stop taking them without talking with your provider first. Endovascular surgery does not cure the underlying problem with your blood vessels. Other blood vessels could be affected in the future. Therefore, it is important to make the lifestyle changes and take the medicines your provider recommends. Take all medicines your doctor has prescribed as directed. This may include medicines to lower cholesterol, manage high blood pressure, and treat diabetes. Your leg or arm below where the catheter was inserted changes color, becomes cool to the touch, pale, or numb. The small incision for your catheter becomes red or painful. Yellow or green discharge is draining from the incision for your catheter. You have dizziness or fainting, or you are very tired. You are coughing up blood, or yellow or green mucus. Your urine becomes dark colored or you do not urinate as much as usual. You are not able to move your legs. Your belly starts to swell and is painful. Reviewed By: Michael Sobel, MD, Professor of Vascular Surgery, University of Washington, Seattle, WA. Also reviewed by David Zieve, MD, MHA, Medical Director, Brenda Conaway, Editorial Director, and the A.D.A.M. Editorial team.